Sometimes the best decorating ideas start at home. When Julie of Creating This Life shared her fall arrangement she made by taking a walk in her yard last week, I was inspired to see what was in my yard. 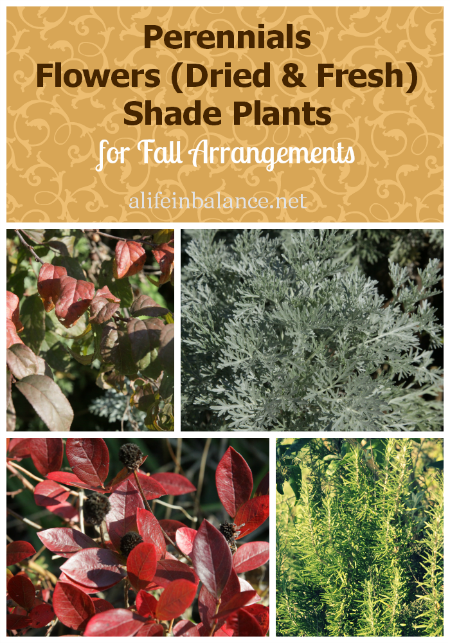 My youngest son and I spent about 15 minutes wandering around looking for blooming shrubs and perennials, shrubs with fall colors, and interesting dried flowers. We found lots of plant options to choose from. If you’re like me, you’ve got lots of flowers growing in your yard – echinecia, sedum, roses, chrystanthemum, dhalia, and aster. All of these are still blooming in the fall especially if you have a warm fall. Stick to flowers with long stems which are easy to use in arrangements. Some flowers are still in bloom in late October. Our climbing rose on our back porch still has peach blooms. The echinacea has a few blooms left. Of course, the mums are covered in flowers. Don’t forget to look for dead, dried flowers. The hydrangeas growing in the shaded area in our yard had a wonderful reddish tinge to the petals, unlike the completely brown ones growing in the direct sun. 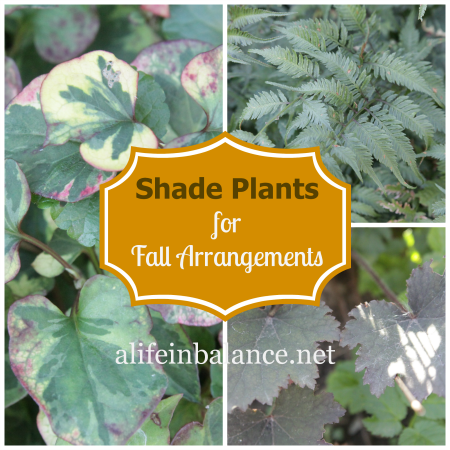 While many plants in the sunny areas of the yard are dying back or just plain green, we found several low-growing perennials and a fern in the shaded area with multicolored leaves. Next spring, when you’re at the garden center looking for perennials to fill in spots, think about adding visual interest through colored leaves which you can take advantage of in the fall when the flowers are gone. I love plants with fluorescent green or reddish-tinged leaves like heuchera. 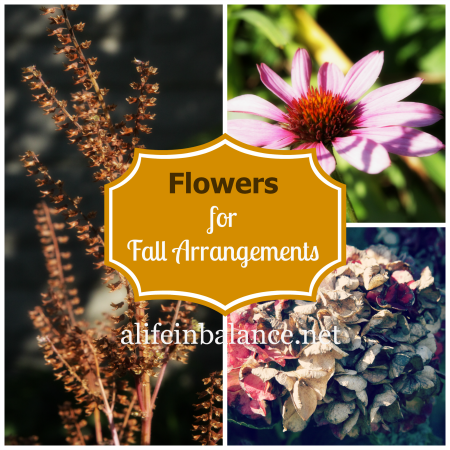 Watch the video to see the fall arrangement my son and I created from what we found in our yard. Lovely! I loved the video. I wish I had rosemary growing in my yard. Thank you and thank you for the inspiration. I forgot all about what I had growing in my yard. Beautiful! My whole yard is sunny, it’s only shadowed by my brown thumb But how hard is rosemary? That’s one I love. Gina Badalaty recently posted..Halloween Recap! Rosemary is pretty hardy. Thanks to our recent mild winters, the one in the picture has survived for several years. You would probably do well growing it since it doesn’t need a ton of water, just sun. I love this Barb! Gorgeous plants and arrangements! Great video and I’m impressed with everything you have growing in your yard! Thank you! I’m always willing to share! Mammasaurus recently posted..26. How Does Your Garden Grow? Sara (@mumturnedmom) recently posted..How does your garden grow? I love the flowers and plants you selected to highlight. I wish I had a green thumb like you. Thanks Barb for sharing this with us at Talking Tuesday!